or any time the mood strikes! Summer is knocking on our door and we couldn’t be more excited for longer lazier days and festivities with friends. This time of year there are many things to celebrate and what better way than to have a fun, festive drink in hand? That is the theme for this month’s Recipe Redux, cocktails and mocktails for May celebrations. I initially had a hard time coming up with an idea of a fun beverage to make. Admittedly, I’m more of a wine girl than anything else. I rarely drink liquor any more and like an occasional beer. Wine is always my go to. I’m also a seasonal wine drinker – white or rosé wine in hot weather and red wine in cold weather. Though lately, I’m loving my red wine slightly chilled. 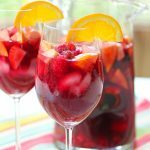 And then it hit me – sangria!! 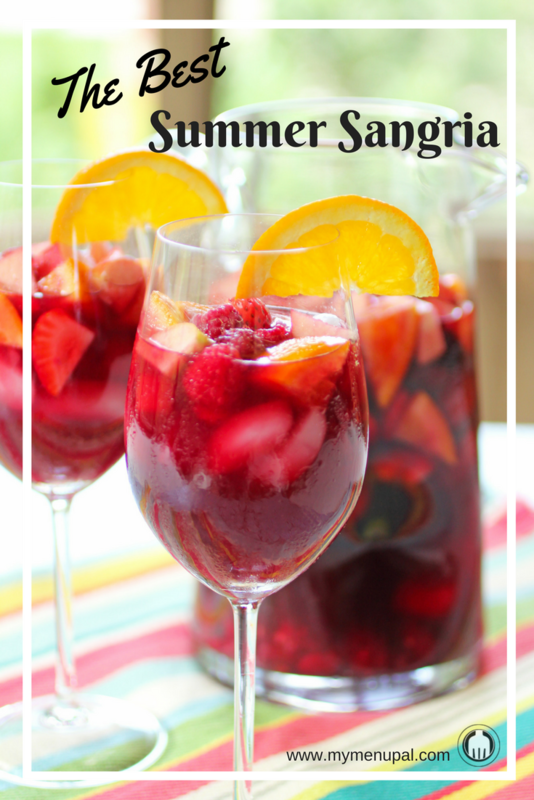 I just love sangria – especially when the weather heats up it is the perfect combo of fruit and of course wine! Many years ago, I lived in New York City. And one of my friends from Mexico made the BEST sangria for a party. I begged him for the recipe and he finally gave it to me after I moved away. No lie, that recipe sat in my email inbox for YEARS. I’m one of those people who has a hard time deleting anything. I finally cut and paste the recipe into a word document though and filed it away in my computer, long forgotten, until now! And the recipe is so stinking simple, I can’t believe I’ve never actually made it. Though now that I’ve finally done it, I foresee myself making it over and over this summer. I served it to some friends and they all loved it as well, commenting on how it was the perfect balance of wine and fruit without being overly sweet. Nothing ruins a good sangria like too much sugar, or ice. Word to the wise, chill your red wine first! After I made the batch and took pictures, my children felt left out. They wanted to try it (and of course get in a picture or two!) – it is such a pretty drink with all of the fruit. So I made a non-alcoholic version just for them using Welch’s 100% grape juice. I skipped the little bit of sugar in the recipe, and just used a squeeze of lime juice, cut up fruit and the grape juice. You could even top it with a little lime flavored seltzer water for some extra fizz if you want. They loved their “special” drink! 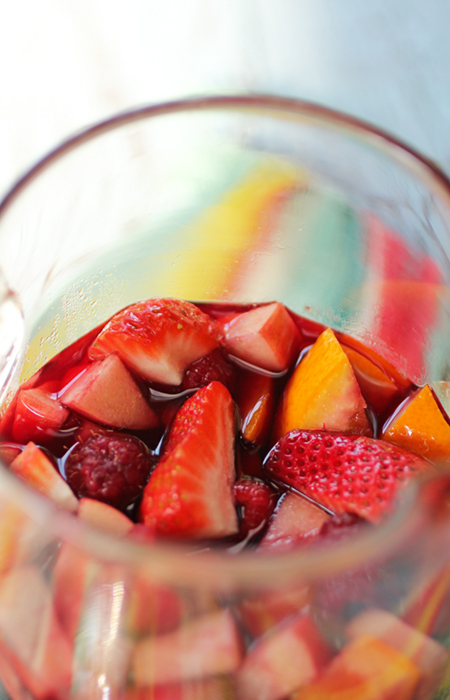 Sangria is the perfect summer drink! 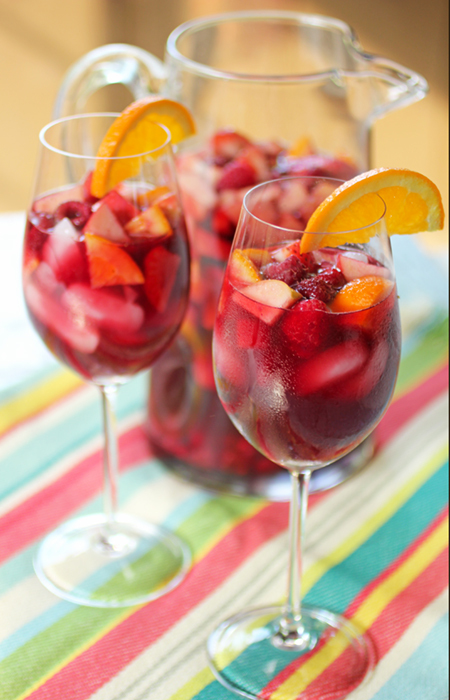 Start with chilled red wine and chilled fruit so you can use less ice in your glass for a refreshing, festive drink. Juice the limes and add the juice to a large pitcher. Add the sugar and stir until it dissolves in the lime juice. Add the chopped fruit. Pour in the wine and stir well. Adjust taste with more lime juice and sugar as needed. 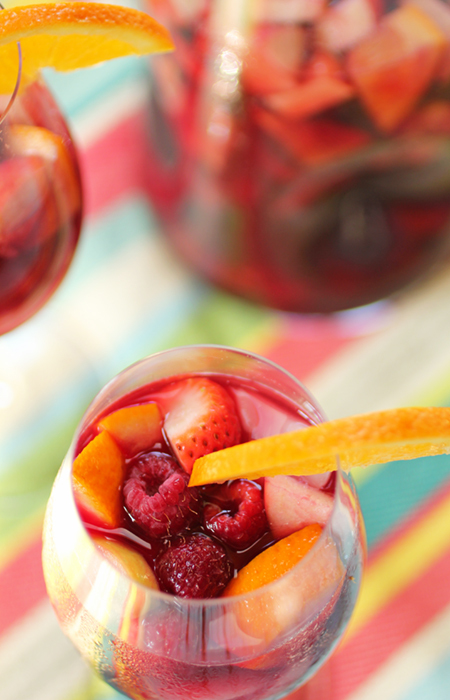 Pour sangria over ice and enjoy! 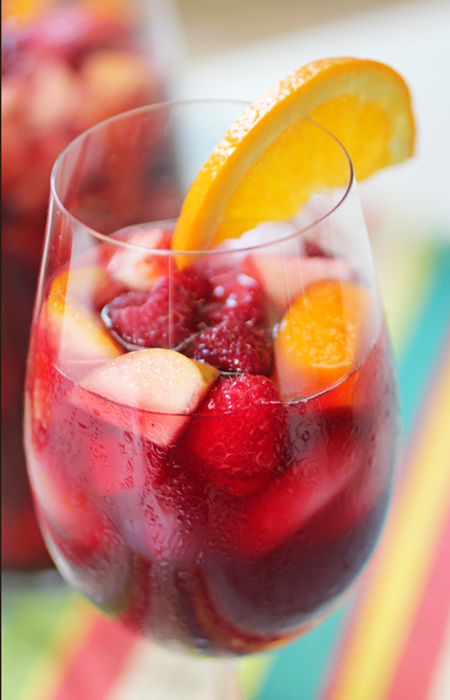 Chef's Note: Chill the red wine and the fruit first so the sangria is already chilled and won't melt the ice as fast. Mix It Up: Use any fresh fruit that is in season or that you have available. 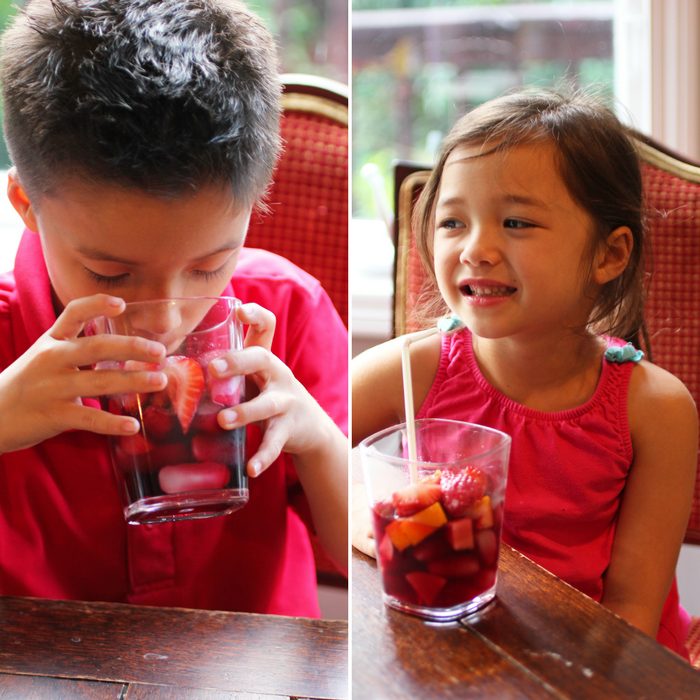 Kid-Friendly: Make a non-alcoholic version for your kids. Skip the sugar and add lime juice to 100% grape juice with all of the chopped fruit. Top off with lime-flavored seltzer water if you want to give it a refreshing sparkle. Be Sure To Check Out the Other Recipe Redux Drink Creations!